Initially, this lake was built as a percolation tank by the Mysore King, to serve as source of drinking water for residents and was used for other chores like bathing, washing, etc. In 1976, the lake has been taken as a part of Mysore Zoo. Since then, it has been maintained by the Mysore Zoo authority. 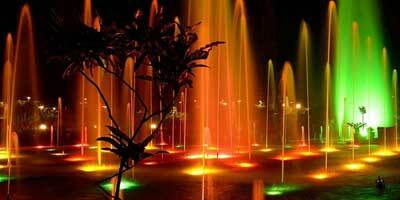 Also known as Fountain Lake it is spread across an area of 90 hectares of lush greenery and rich fauna; out of 90 hectares of area, 55 hectares is the water spread area while the foreshore area is around 35 hectares. Just a leisure walk around the lake also promises to give you a few peaceful moments amidst the beautiful natural setting. Apart from offering a breath-taking scenic beauty, this lake does have a wide range of facilities to keep visitors entertained. For kids, there is a special children's corner. The boating at the lake is quite enjoyable, letting you to experience the refreshing serenity of the lake. This place is perfect for picnics as well. Many visitors can be seen relaxing and enjoying meals with their loved ones. Tourists are allowed to bring packed food inside this area. There is a coffee booth as well. Karanji lake is not only for visitors who want to relax in the midst of nature but an ideal place for birdwatchers too. With around 147 species of birds, this area presents amazing opportunities to get a glimpse of birds such as Sandpipers, Asian open bill storks, herons, egrets, greenish warbler, rose ringed parakeet, brown shrike, red-whiskered bulbul, red wattled lapwing, booted warbler, black drongo and sunbird. painted stork, ibis, egret, cormorant, grey pelican, etc are some of the common migratory birds that can be spotted here. This lake boasts of having the largest walk-through aviary in India. This aviary, which was built with a cost of over 3.8 million, is 20 m high, 50 wide and is of 60 m length. This aviary at Karanji Lake has an artificial waterfall along with two other water bodies. The water in the aviary is pumped from Karanji Lake while the used water is pumped outside again into the lake. Another attractive feature of this lake is the Butterfly Park. This park has been built over a small island within the Karanji Lake. A must visit for nature lovers, this butterfly park boasts of more than 45 captivating species of butterflies. One can see various host plants and nectar plants which have been planted here to facilitate breeding and sustenance of butterflies. Some of these plants have been brought from various hill-stations. Another attraction at the lake is the Regional Museum of Natural History, which is located on its banks, providing information on the natural environment of South India, and on the nature conservation. It was inaugurated in the year of 1995 with the prime objectives of showcasing flora, fauna and geographical aspects of Southern India and emphasising on the conservation of nature and its resources by illustrating the interrelationship between plants and animals. It also aims to create environmental awareness through various programs. You can visit Karanji Lake from 08.30 am to 05.30 pm on all days throughout the week, except on Tuesdays. The entry fee of the Karanji Lake is also minimal which allows everyone to enjoy its serene beauty. It is Rs.10 per person. For video camera, the charges are Rs.25 and still camera charges are Rs.10. Karanji Lake lies at a distance of 2 km from the Mysore Palace. It is situated at the bottom of the majestic Chamundi hills which is another popular sightseeing place in Mysore; the famous Chamundeshwari temple is located here. It is quite close to the center of the city which makes it easily accessible too. Its proximity to the city bus stop makes visit this lake even easier. From Mysore railway station, it is about 5 km away. Hence, tourists can easily take an auto-rickshaw or book cab and reach the lake from the railway station or bus stand.